As someone trying to get traffic to a nonprofit website, you have to admit it can be thrilling to quickly log in to Google Analytics, look for nice stats and then peace out. On the flip side, you might notice some dips in traffic or high bounce rates and panic, wondering if you need a drastic change in strategy. Either way, the data you’re taking in isn’t telling the full story. In fact, it might be telling you the wrong story. Before we get into that, if you’re not even checking your website metrics, we need to talk. I know you don’t have a lot of spare time, but numbers matter. If you can understand your site data, you can understand what website content interests users or why they don’t convert on your donate now form. 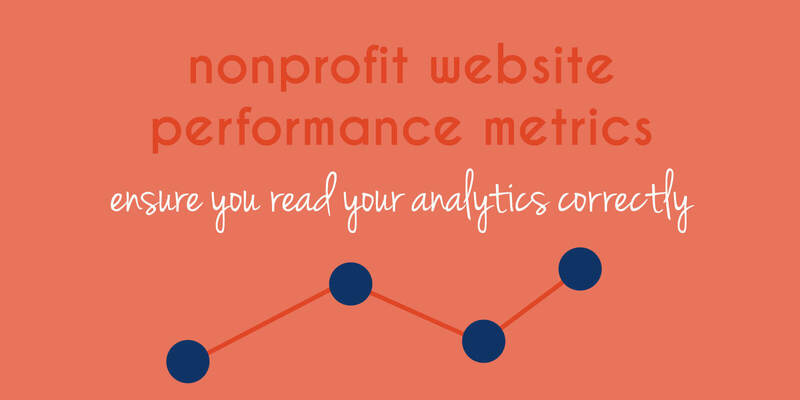 To fully understand how vital these numbers are, read why and how to do more with Google Analytics for nonprofits. Now, let’s reassess how you’re viewing and interpreting your website performance metrics and how you can ensure you’re taking the right action based on these numbers. This stat gets marketers excited as it can highlight information regarding the user experience on your site. Some marketers interpret it as users enjoying your content and site flow enough to look at more than one page. However, it’s not that simple. This could also indicate that people are landing on your site and not finding what they want. They have to click through several pages to get to the volunteer information for which they originally came to the site. To understand if people are finding and enjoying your content, first come up with a hypothesis. Then use a combination of metrics and tools—such as the User Explorer Report—to see if this hypothesis is supported. *What is "time on page?" The length of time—in minutes—a user spends on a web page before moving to another page on your site or exiting completely. Similar to pages per session, a higher time on site can indicate that people aren’t finding the content they want fast enough. To better understand this metric, combine it with other stats. For example, bounce rate: if your time on page is high and so is your bounce rate, it could indicate people searched all over the page but left when their search didn’t bring up what they wanted. Besides that, you can consider the page you’re looking at. You should be able to tell if it’s clean vs. cluttered. If it’s clean and strategically laid out, a corresponding high time on page could very well mean success. *What is "bounce rate?" The percentage of visitors that after landing on the web page from an outside source, leave the web page without visiting other site pages. A high bounce rate often freaks us out. However, it doesn’t necessarily mean that people don’t like your content. For one, it could be Google’s fault. Or rather, the user typed in a search, Google brought up your nonprofit’s content in search results, but when the user came to your site the content wasn’t a fit. Not your fault, just a mismatch between query and result. To help Google avoid this, be picky with the content you put on your site. A high bounce rate could also indicate that your blog post was what the user wanted, but it didn’t lead them to take action. This isn’t necessarily bad, as they would appreciate you delivered an answer and then return for more later. However, if you want to take advantage of that content, include calls to action or other related content. In the end, we want to point out that these high and low metrics are not equivalent to failure. Be weary of looking at just one metric at a time and always pay attention to context. For help on setting up your Google Analytics, receiving a monthly report or simply understanding what you see, contact our team of experts at ArcStone. ⟵Visuals matter. Learn the basics of design for nonprofits.